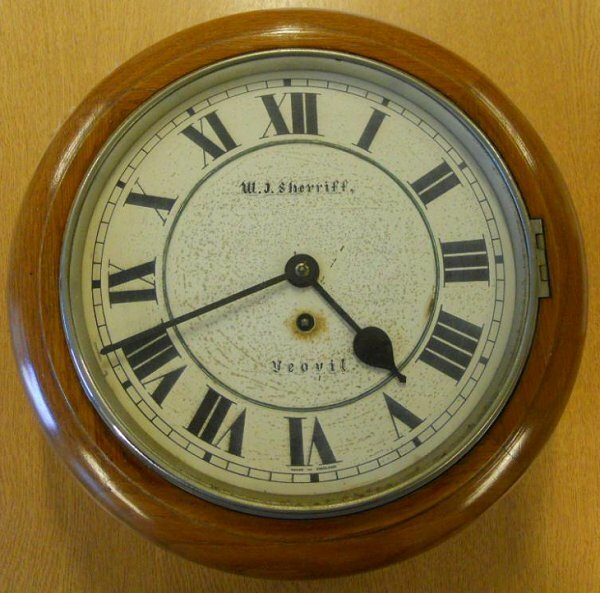 Unfortunately there is actually very little information regarding William John Sherriff but there is at least one example of his work as a clockmaker (see Gallery below). He was born on 29 March 1891 at Farnham, Surrey, and became a jeweller and watch and clock maker with premises in Market Street, certainly from 1929 when his premises were burgled. William was listed as a jeweller of Market Street in Kelly's Directory of 1935 and he was still operating in 1954 when he was listed in Edwin Snell's Directory. Foord's Directory of 1964 listed William James Sherriff as a Watchmaker and Jeweller of Market Street - presumably William John's son. William Snr was a member of the Methodist church in Vicarage Street and in 1933 it was noted that he was a tenor in the Methodist Church Choir. In May 1949 he was chairman of a youth rally held at the church. William John Sherriff died in Yeovil in the winter of 1972. Sadly, I have no further information at present. A report from the 10 September 1929 edition of the Exeter & Plymouth Gazette confirming that William was trading in Market Street by this date. A clock made by William John Sherriff in a style typical of the 1940s.